Talk To Me, review. I can live with that! But for two of those friends, what starts as a walk in the park turns sinister with the gruesome discovery of a body. Soon, talkback radio gets involved and things get totally out of hand. Garry is drawn into a plot that threatens his close friend. Meanwhile secret meetings and plans are made and loyal listeners take sides as more and more people ring in to the radio station. This is an interesting book, both in terms of content and trying to find the right rating in a review. It begins well, as we're dropped into the life of Garry, a stressed talkback radio host who loves to walk his dog, Spot, is struggling to deal with a combative producer, and barely sees his partner. Neil Coleman brings the craziness of talkback radio to life well, as Garry tries to balance having discussions about 'in-the-news' issues with entertainment value and ratings, while juggling a panoply of callers. Then Garry becomes parts of the news himself, as a dead body is discovered in a park where he walks Spot, and a new caller, Todd, appears to know far too much. Is Garry conversing with a killer? As the pressure mounts, so does Garry's stress - but ratings are at an all-time high and he's suddenly the golden boy for the radio station. How can he juggle a police investigation with his newfound fame, and his increasing fears as Todd starts stalking Garry off the air? It's a clever and cool set-up, and an interesting setting for a crime novel (talkback radio and the off-air life of notorious hosts). However, I ended up having mixed feelings about this light-hearted mystery as a whole. 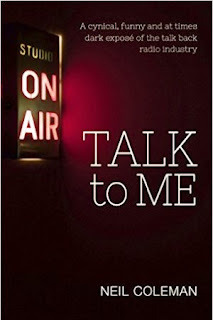 TALK TO ME showed plenty of promise, and delivered on some of it - with interesting characters, some quirky incidents, and a nice dose of humour threaded throughout. There's a lot that a reader can enjoy. But I was bothered by a few things, which started pulling me out of what was a good underlying story. Firstly, much of the tale is told through dialogue rather than description. This could be a clever device, given the setting is talkback radio, but as the pages turned it grew a little wearisome for me - the dialogue became more expository and on-the-nose, explaining the story and what the reader needed to know rather than feeling natural. Characters would repeatedly lay out the current situation without much subtext. There were also some 'huh?' moments in terms of how the police or others acted, which just didn't seem authentic to me. Novels do require suspension of disbelief, but for me there needs to be a balance between believability and story - and perhaps because I was already a little disengaged rather than completely caught up in the story, little things like that disrupted the narrative for me. This may not be the case for other readers, as it is an exciting, interesting underlying story. So I was left with a semi-satisfied feel after reading the book. There were lots of promising things, but also little bits that broke up an otherwise smooth read. Coleman does a good job at creating an interesting cast, and bringing to life the behind-the-scenes world of talkback radio. I was hoping for a little more after a good set-up, but I did feel intrigued enough to keep reading to the very end.